Öyvind Fahlström (1928-1976) was a Swedish Multimedia artist who was greatly interested in using games in art. His interest in games arose from his earlier work in concrete poetry, or poetry in which the way the words are arranged visually is just as important to conveying intention as the words themselves. From this came his idea of variable painting, or art in which the artist asks the audience to control aspects of the visual piece. How the audience is asked to interact with each piece varies. Some ask the audience to use play to engage with a theme, while others are more complex game systems. 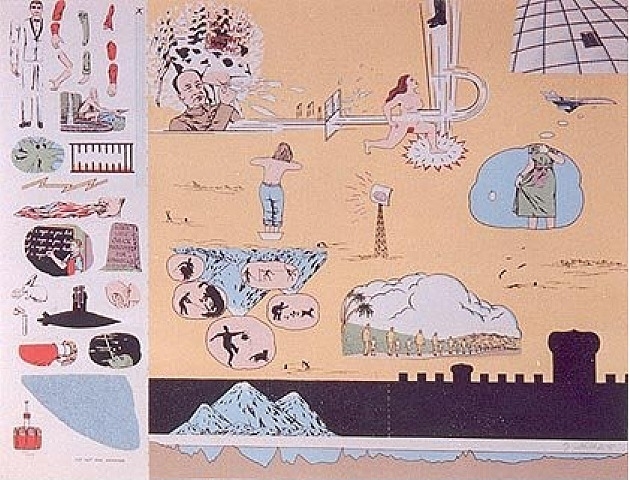 Eddie (Sylvie’s brother) in the Desert (1966) is a print piece that includes the words “CUT OUT AND ARRANGE” in the lower right. The idea was that collectors would cut out the pieces and create their own variable print. Each one unique, yet unified around his visual themes. 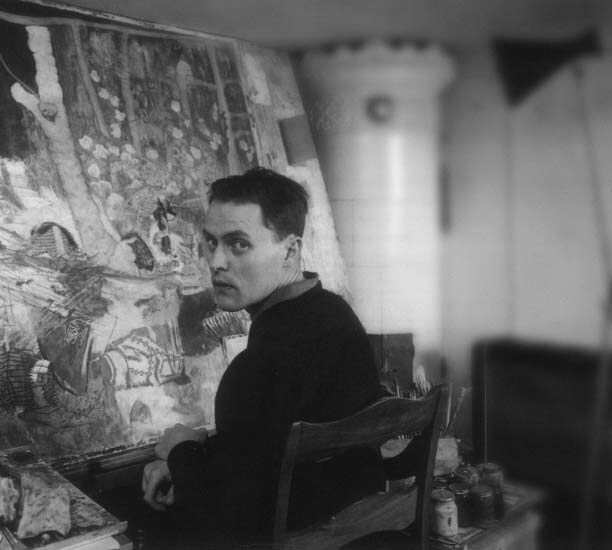 Fahlström participated as well, creating at least three variable collages of his own that were displayed. A big reason behind variable painting was a criticism of capitalism. Mass produced variable art could allow everyone, rich and not rich-alike, to own and experience art. Since every piece was unique, it also challenged the idea that art was more valuable because it was popular or rarer. Everyone could own a one-of-a-kind Fahlström. Everyone could participate in art. The Little General (Pinball Machine) (1967) is one of Fahlström’s first game inspired pieces. A “swimming pool” is filled with images painted on photographic paper which freely “float” on the surface. These images can be manipulated by the audience blowing on them or pushing them in various ways. The piece transforms through the viewer’s interaction. Images change and combine with others, creating new meaning. Fahlström included various references to international political figures and events, and the manipulation and combination of these images allowed Fahlström to convey his own political ideas as well as allow the audience to create their own. 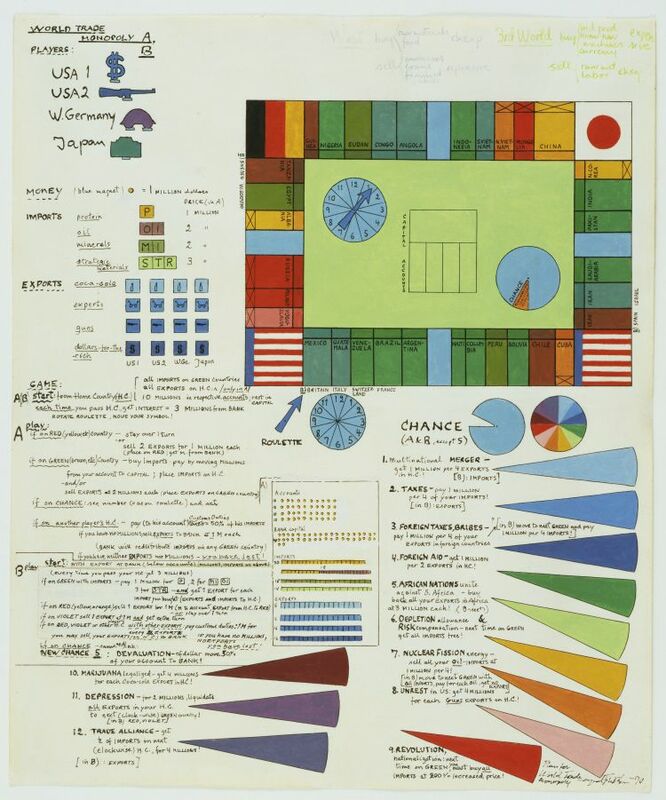 “… because you have these fixed elements with different values, and there are various figures charged with emotional connotations, each person can set up their own relationship to them and create constellations…” The images are color-coded, allowing an audience member to “play” as the United States, Russia, China or the Third World and compete for dominance over the images. The images even have scores assigned to them, in order to make the connection to pinball and games even more direct, although no actual rules or method of using these scores is ever given. Fahlström’s most obviously game-inspired work are his variable Monopoly sets created in the 1970s. Several different versions of this game were created, each with handpainted vinyl and magnets. These paintings can be played to allow the audience insight into world trade, politics, the battle of US political ideologies, liberation and other topics. “By choosing sides and strategies the player will be involved in a miniature political psycho-drama. The game can be played intensively in an hour with two or four participants. Or by one person, while the clear colors slowly change on the surface, like a tree through the seasons. These game paintings will only be meaningful when they have been made into mass-multiple editions.” The game paintings allowed the audience to recreate simplified forms of the complex systems that defined political reality. It should be noted that at the same time the only commercial video game available were the niche Magnavox Odyssey and Atari Pong. The idea of game systems art and play as a method of critique predates video games by quite a bit. Fahlström was not working in a vacuum, there were many other artists and critics either working with games and play on their own, or debating its merits as a “valid” art form or how to properly categorize it. Breaking free of the idea that game art “began” with Mario or even Pong is as liberating as realizing that there are comic strips decorating Angkor Wat or discovering that Prehistoric humans were making animation on cave walls. We, as an industry and as a “community” of game makers and players, are trapped in so many myths about games. Myths about what is a game, about what value games have, about how games connect to other art, about who is allowed to make games. By setting up arbitrary barriers on the origins and definitions of art, we doom ourselves to continuously debate these same myths without moving forward. All too often game discussion presents only the illusion of moving forward. Modern video games owe a large debt to artists such as Öyvind Fahlström, Yoko Ono, and countless unsung others. Perhaps an even larger debt than to the inventors of the technology itself. This entry was posted in Video Games of the Oppressed and tagged Analogue Games of the Oppressed, Öyvind Fahlström, Conceptual Art, Defining Games, Spect-actor. Bookmark the permalink.